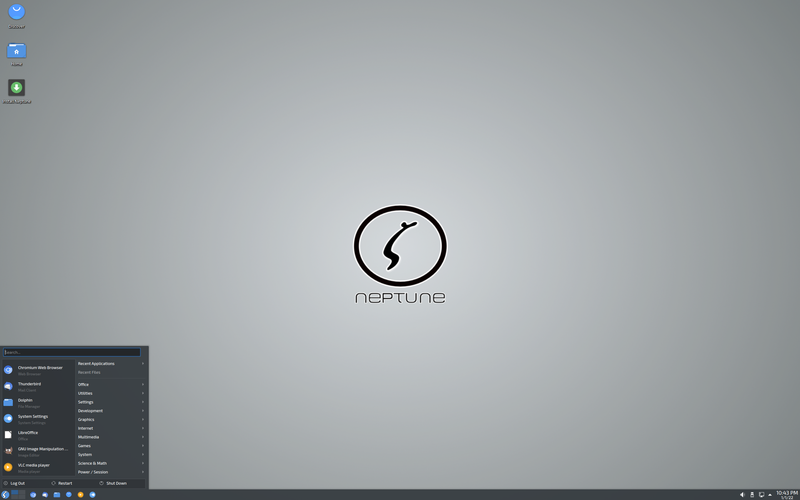 Rate this project Neptune is a Linux distribution based on Debian's Stable branch. The project's latest release, Neptune 5.0 "Refresh", is based on Debian 9 Stretch and includes KDE's Plasma 5.12 LTS desktop. Version 4.14 of the Linux kernel has been backported to provide additional hardware support: "This version marks a new iteration within the Neptune universe. It switches its base to the current Debian Stable "Stretch" version and also changes slightly the way we will provide updates for Neptune. We will no longer strive to bring in more recent versions of Plasma, kernel or other software on our own. With Snaps, Flatpaks and AppImages being more and more popular and mature these days we strongly believe these are the ways to go if you want to try out bleeding edge software. We on the other hand strive to provide the most stable and best desktop user experience out there. This is why we decided you to provide the latest LTS release of Plasma version 5.12 together with KDE Applications 17.12 as well as KDE Frameworks 5.43." Further information and screen shots can be found in the project's release announcement. Download (SHA256): Neptune5-Plasma5-20180310.iso (2,112MB, signature, torrent, pkglist). Leszek Lesner has announced the release of Neptune 5.6, the latest stable version of the project's Debian-based desktop Linux distribution featuring the KDE Plasma 5.12 desktop: "We are proud to announce version 5.6 of Neptune. This update represents the current state of Neptune 5 and renews the ISO image so if you install Neptune, you don't have to download tons of updates. In this update we have improved hardware support further by providing Linux kernel 4.18.6 with improved drivers and bug fixes. Updated the DDX drivers for AMD/ATI and Intel as well, providing Mesa 18.1.9. The X.Org Server has been updated to version 1.19.6 which fixes several bugs and brings speed improvements. Other main changes in this version are the update of systemd to version 239 and KDE Applications to version 18.08.2. Network-Manager has been updated to 1.14 to improve WiFi network stability and speed. Plasma Desktop has been updated to 5.12.7 to provide bug fixes. It includes fixes for Krunner to allow setting the web shortcuts and spell-checking options for its plugins. connections with sftp via KIO are now more stable and reliable even after reconnecting to a device." Read the rest of the release announcement for more information. Download: Neptune5-Plasma5-20181103.iso (2,142MB, SHA256, signature, pkglist). Leszek Lesner has announced the release of Neptune 5.4, an updated build of the project's desktop Linux distribution based on Debian's "stable branch" and featuring the KDE Plasma 5.12 desktop: "We are proud to announce version 5.4 of Neptune. In this update we introduce a new look-and-feel package called 'Neptune Dark'. It comes together with a modified icon theme, called 'Faenza Dark'. We improved hardware support further by providing Linux kernel 4.16.16 with improved drivers and bug fixes. Other main changes in this version are the update of KDE Frameworks to version 5.48 and KDE Applications to version 18.04.3. As the new KF5 version is not compatible with Qt 5.7 anymore we had to backport its patches to version 5.45. VLC has been updated to 3.0.3 to provide more speed and lots of bug fixes. Thunderbird 52.9 fixes issues with encrypted HTML e-mails. The Excalibur menu is now available in version 2.7 which provides some bug fixes in regards to multiple activities and moving favorites around. KWin, the default window manager for Plasma, got an update to version 5.12.5 which is now the real version and which we adjusted to be compiled against Qt 5.7." See the release announcement and changelog for further details. Download (SHA256): Neptune5-Plasma5-20180721.iso (2,120MB, signature, pkglist). The Neptune project has released the fifth update to the distribution's 4.x series. The new release features application and kernel updates. The new version, Neptune 4.5, removes TrueCrypt in favour of the VeraCrypt encrypted storage software. "We are proud to announce Neptune 4.5, the fifth service release to the Neptune 4.x series. This version comes with some core updates to the system including LTS Kernel 3.18.25, systemd 227, libc6 2.19, Mesa 10.5.9, ALSA 1.0.27 and more. For the first time we also offer a testing version of our Plasma 5 version based on Plasma 5.5.3 as a separate ISO download. The usual software Updates like Chromium updated to version 46 and Icedove to 38.5 are also included. We replaced TrueCrypt with VeraCrypt which is compatible with TrueCrypt containers." Further details and screen shots can be found in the project's release announcement. Download (MD5): Neptune45.iso (1,903MB, pkglist). The developers of Neptune, a desktop oriented distribution based on Debian, have announced the launch of Neptune 4.4. The new release updates several key components, including parts of the graphics stack, offering better video card support and better performance. Improvements have also been introduced to the partition manager, enabling users to manipulate btrfs volumes. "This version features a new LTS kernel 3.18.16 which delivers better and more modern hardware support. We also did the biggest update in the graphics stack since Neptune 4.0 by upgrading to X.Org Server 1.17 and Mesa 10.5.8. This brings in support for modern graphic cards and better 3D performance. Old chips like voodoo or sis however aren't supported any more. We updated the HPlip driver to support newer HP printers. We improved the user interface by introducing a new modern looking font as well as bigger scrollbars." Additional information and screen shots are available in the project's release announcement. Download (MD5): Neptune44.iso (1,876MB, torrent, pkglist). A new stable release of the Neptune distribution has been made available. The new release, version 4.3, provides users with more up-to-date software and a number of bug fixes. "This is the third service release to Neptune 4 and comes with improvements, bug fixes and updates. This includes Chromium in version 41, VLC in version 2.2, LibreOffice 4.3.3 as well as Icedove 31.5 and many more. The foundation of this release is represented by the current Debian 7.8 ('Wheezy')." The release announcement goes on to detail a number of fixes and improvements added to this release: "This new version also offers Updates for Kdenlive which bring in better codec support as well as a fix for the localization of video effects. Kernel 3.16.3 was updated with fixes for Btrfs and nouveau. There is also better Btrfs support with Grub 2.0.2 Beta 2. The problem with Persistent Creator in the live media not being able to format the persistency file on a non german localization has been solved. Smartphones and media players are now better supported with mtp library version 1.1.8. For a detailed overview take a look at our changelog." Download: Neptune43.iso (1,843MB, MD5, torrent, pkglist). Leszek Lesner has announced the release of Neptune 4.0 (formerly known as ZevenOS "Neptune" edition), an updated release of the project's Debian-based distribution with KDE 4.13.2 as the default desktop: "The Neptune team is proud to present the release of Neptune 4.0, code name 'It's all about you'. This version focuses on user requests and it brings a bunch of new ground-breaking changes, like Linux kernel 3.13.11, KDE SC 4.13.2, systemd 204, Encode 3.0, Recffmpeg 1.8.5, LibreOffice 4.2, Chromium 35, default Btrfs, a brand new design and so much more. We modernized the look and feel of Neptune without loosing the touch of simplicity and easy going with the introduction of our new design. We aimed to create a distraction-free desktop experience. The base of Neptune 4.0 is the Linux kernel 3.13.11 with bunch of new drivers, fixes and support of new hardware." Read the rest of the release announcement for further information. Download (MD5): Neptune4.iso (1,880MB, torrent).